With the Kentucky Derby coming up this Saturday I have all things Kentucky on my mind. Well, I have bourbon on my mind at least. There is nothing better than sitting back with a couple of fingers of good old Kentucky bourbon, so it is easy for me to write about the stuff. However, there are a bunch of bourbon-related products out there that are just as exciting. 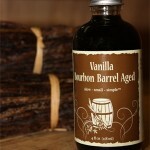 I recently came across Bourbon Barrel Aged Vanilla, and I love the idea of it. I love vanilla extracts and have been known to add it to all sorts of things from cakes to Diet Coke, so the idea of a vanilla infused with bourbon flavor is right up my filthy little alley. This vanilla extract is offered by Bourbon Barrel Foods, a company that offers all sorts of product with a bourbon theme – and therefore receives my 100% endorsement. Cheers! Find all the great products of Bourbon Barrel Foods here. The May issue of Sunset magazine arrived in my Post Office box the other day and I have been obsessed with the cover ever since. 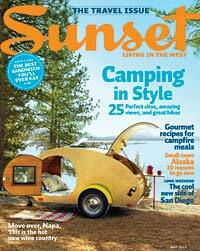 Sunset’s cover features a campsite including an awesome teardrop camper – and now I really want one. 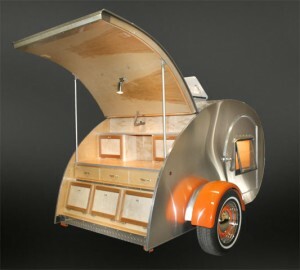 Teardrop campers were a big deal in the mid-last-century and have been making a bit of a comeback in recent times. I am told that they are more and more popular as they are lighter than the campers we have been more used to seeing and are able to be pulled by smaller more gas efficient cars of the day. I don’t care why, I just need to get my hands on one. Thankfully there are places our there like Vacations in a Can that specialize in new, vintage, and custom teardrops. I will be keeping my eye out for one to show up locally. And when it does, I don’t plan on going camping with it. I fancy just putting out in the back yard and hanging out in it all summer. A few months ago I was listening to a cooking show on the radio as I am known to do. One of the guests on the show was Yotam Ottolenghi, a London restaurateur who was promoting his new cookbook, Plenty – Vibrant Vegetable Recipes from London’s Ottolenghi. The interview was your basic cookbook conversation and I was only half listening until I heard Mr. Ottolenghi and the host taking about his recipe for Grape Leaf Herb & Yogurt Pie. Grape Leaf Herb & Yogurt Pie? I was sold. Plenty has one big claim to fame in my world – it was the first (and to date only) cookbook I have purchased on my Kindle, and it is fabulous. The dishes presented here are all vegetarian recipes. However, the thing I really like about the book is it is not a “vegetarian cookbook” per se, more of a collection of recipes that just happen to feature no meat. Many of these dishes would compliment meat and others stand alone as a main course. I have yet to attempt the Grape Leaf Herb & Yogurt Pie – I am too in love with the idea of it and don’t want to risk messing it up – but I have picked up a few hints and ideas that I have adapted into my own meals. Just what a good cookbook can do. 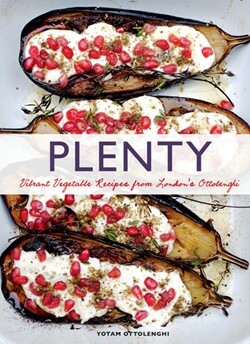 Plenty – Vibrant Vegetable Recipes from London’s Ottolenghi is available from Amazon and other booksellers. I don’t often find myself poring over high fashion jewelry designers’ websites. However, recently I was attracted to designer Alexis Bittar’s site due to his wonderful marketing campaign featuring Edina and Patsy of Britcom classic Absolutely Fabulous fame. After ogling the campaign and waxing nostalgic for the many hours I spent with Edina and Patsy during the Clinton administration, I stumbled upon the Bed Bug Money Box. 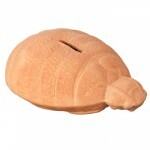 The Bed Bug Money Box is described as “hand cast terracotta bed-bug change box designed to be broken up when full.” I describe it as just plain fun. I love the idea of an old-school piggy bank type of thing that is made to hold loose change and when you can’t fit anymore inside you have the satisfaction of smashing it open with a hammer and running to the corner store to buy candy. More than anything, I love the terracotta of th Bed Bug Money Box, and I think it would look great on my bedroom dresser holding change versus the empty margarine bowl I currently use. Oh yeah, one last thing the Bed Bug Money Box, which retails for $40 is on sale now for $9.75! Visit the Alexis Bittar sire here to see what all the cool kids are talking about. For some reason I have been noticing a lot of higher-end products lately. Maybe it is all the attention given to recent record lottery prizes and I have been thinking about what I would do with all the money. But it is probably just how my eye is attracted to cool things. One of my recent finds (although I have loved it for years) is the Mah Jong Modular Sofa by Roche Bobois, which I just love. 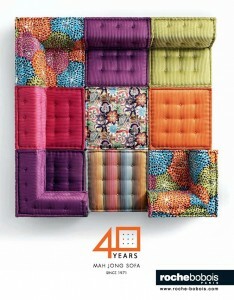 The Mah Jong Modular Sofa is just a lot of fun and I love how eclectic it is. I think this would work well in almost any setting. I have lived in modern urban homes where this would look great and I think would be fun in the antique farmhouse where I currently reside. What is fun about it is that you can mix and match the sofa to go along with a mix of other furnishings and decorations you may have. Looking around my home now I have quite a mix of things. A few furnishing I have had since college, tons of vintage finds and remnants from when this was my parents’ home. Sprinkle in a leather couch and loveseat and few IKEA touches and you have, well, a mess, but I love it. Roche Bobois is certainly not IKEA, but it’ll do in a pinch. See all the great products of Roche Bobois here. The weather this [ast week was pleasant and dry, so I have been able to get out and do some yard work. This is a big deal, as last year at this time when I was first moving into this house there was still a ton of snow on the ground. I remember it snowed about six inches the day before Easter, which was April 24th last year. Crazy! Despite the mild temperatures and dry weather this year, it is just a matter of time until the spring rains come and make things all muddy again. So I have been taking full advantage of the situation by picking up the tree branches that fell during the winter, raking out the flower beds, seeding the bare patches on the lawn and a bunch of other things. It is so hard to believe that the planting season – which means when the frost danger has passed – is still weeks away. But I am busy planning my garden, which means I am attracted to anything related to gardening these days, like the garden tools “built by gardeners for gardeners” of the Garden Tool Company. 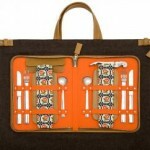 At first look on the Garden Tool Company’s site I will admit I suffered sticker shock on a few items. However, you can just tell these products are well made and will last for many seasons. I can’t tell you how many (cheap) planting shovels I have gone through over the years as the handles break or bend. Anyway, I like the Garden Tool Company’s Japanese Ninji Cultivator Rake. 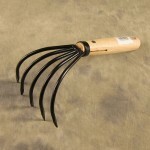 Check out all the great gardening tools the Garden Tool Company offers here. I think living in Boston on this date in 1912 – one hundred years ago – must have been really something. Why? Well, because we are still talking about and appreciating a couple of major events that happened back in April 1912. First, as we have noted, the world was just beginning to hear the stories of the sinking of the Titanic, stories that still intrigue us today. Meanwhile, Boston was just about to celebrate the opening of Fenway Park, which today is the grand dame of American ball parks. As with the centenary of Titanic, there is a flood of tributes to mark the special anniversary of Fenway, including a slew of books. 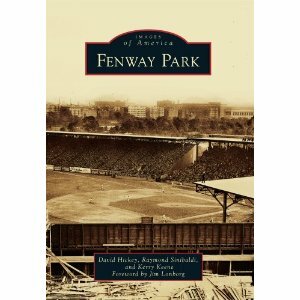 One of the best books I have seen is Fenway Park (Images of America) part of the wonderful Images of America series from Arcadia Publishing. As a lifelong baseball fan, mostly a fan of the Red Sox, I have been to Fenway many times. Every time I step into the Park I experience a wave of nostalgia based on my own experience. In Fenway Park (Images of America), the Park is shown in some wonderful pictures that show how special Fenway is to the collective memory of Boston and indeed our nation. Fenway Park (Images of America) is more than a book about a ballpark of interest only to baseball fans, it is a homage to the unique American popular culture that is the constant of baseball as told through a structure that has marked the time. Fenway Park (Images of America) is available from Amazon and other booksellers. One of the best movie lines in the last decade or so from the film “Tea with Mussolini” and delivered in the signature style of the amazing Dame Maggie Smith. It is true I suppose, that we Americans do not have the flair of the British, the panache of the French or the pure love of food of the Italians, but I for one love picnics. I realize that loving picnics may not be “understanding” them , but any excuse to have a meal outside and I am in. I have a few different picnic baskets which I pull out from time to time and they always make the picnic special. However, my baskets are extremely humble compared to the R. Horn Viennese Picnic Set I found at the Neue Galerie. This Viennese Picnic set is truly a work of art (and priced as such at nearly $700) and it would surely help spread some understanding around these parts. 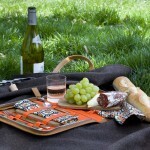 In my fantasy world I would be snapping up things like this picnic set without a thought. But alas, I will muddle through with my little wicker basket with the mismatched flatware. Tour the Neue Galerie New York website here. I often look at an ordinary object and think of it as art. In my own works, I have taken items, or parts of things, and presented them in a way that brings out a quality that transcends their original use. And of course I like a nice vintage find or antique just hanging out on a shelf. Anyway, I was inspired recently when I came across High Falls Mercantile, where amongst other things, a nice collection of vintage items are given a new look. 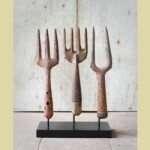 With their “Mounted, Sculptural & Industrial” collection, High Falls Mercantile has created works of art from ordinary items from the past, mostly simple farm tools. I really like what they have done (I particularly like this display of vintage garden tools), and it has sent me back into the barn where I have been seeing all sorts of things in a new light. See all the great products of High Falls Mercantile here. You may have heard, today marks 100 years since the sinking of the Titanic. Thanks to Mr. James Cameron (and Kate and Leo) it seems like just yesterday. Lost Cowboy fans will no doubt be aware that we are not jumping on the centenary bandwagon, as we have marked the anniversary every year since we’ve been around. 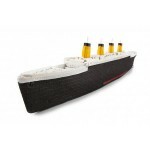 Last year my Titanic post made a promise of making a model of the doomed ship in time for the 100th anniversary. As Anderson Cooper would say, “keeping them honest“, how did I do? Well, I can say I bought the model, glue and paints and I had every intention of making the model, but alas, I did not. However, it sits on a shelf in my studio and many times over the past year I glanced at it and thought “I should get on that.” Maybe for the next anniversary. 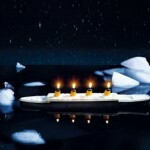 This year I found another cool Titanic item, the Floating Titanic Candle from Design 3003, a German retailer. I just love the idea of a floating ship candle, and making the Titanic is just awesome. I see it floating around in a kiddie pool filled with big chunks of ice and cold water keeping Diet Coke in glass bottles (and other adult beverages) cold for a summer party. The Titanic candle is made by the German design company Donkey Products and is available from them as well on their site. I was not able to find it from a US retailer. Anyway, this candle is very cool. As cool as the Titanic candle is, it is not as cool as the single best Titanic-themed product ever, which was the subject of my very first Titanic anniversary post in 2010 – the Titanic Ice Cube Tray – truly inspired. Lost Cowboy is powered by	WordPress 5.0.4 and delivered to you in 5.237 seconds using 64 queries.